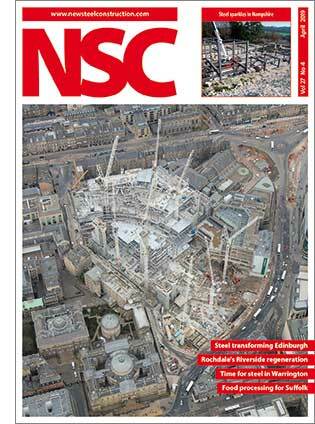 The April issue of New Steel Construction (NSC) is now available in both digital and print formats that will be arriving in the post this week. This month’s cover story is the Edinburgh St James mixed-use scheme, which is dramatically altering a large swathe of the Scottish capital. Hundreds of tonnes of transfer structures are being used to create the different column spacings for retail, leisure and residential elements. NSC also features two town centre retail and leisure led regeneration schemes, kicking off with the Rochdale Riverside project. This is one of the final parts of the town’s £250M investment package, which has been reinvigorating Rochdale since 2011. Over in Warrington, a similar project, known as Time Square is taking place. Steel construction is helping to create a new destination featuring a 13-screen cinema, a market hall, new council offices and retail units. A leading UK food producer is constructing a new £60M steel-framed poultry facility in Suffolk. The building’s frame had to be designed around the complex internal equipment and the design team say only a steel solution was suitable. Viticulture makes its debut in this issue of NSC, as the UK’s oldest commercial vineyard expands its facilities with a new steel-framed wine cellar. NSC also features a Steel for Life Headline Sponsor article on Jamestown, industry news, a technical article and advisory desk from the Steel Construction Institute, and codes and standards updates.